Things didn’t look too good for New Orleans early on last Sunday night. The Saints’ very first play, a deep pass intended for receiver Ted Ginn Jr., ended up short of the mark and it ended up in the grateful hands of Eagles cornerback Cre’Von LeBlanc. From there, Nick Foles and the Philadelphia Eagles orchestrated two touchdown drives, which left the home team in a 14-point hole by the end of the first quarter. 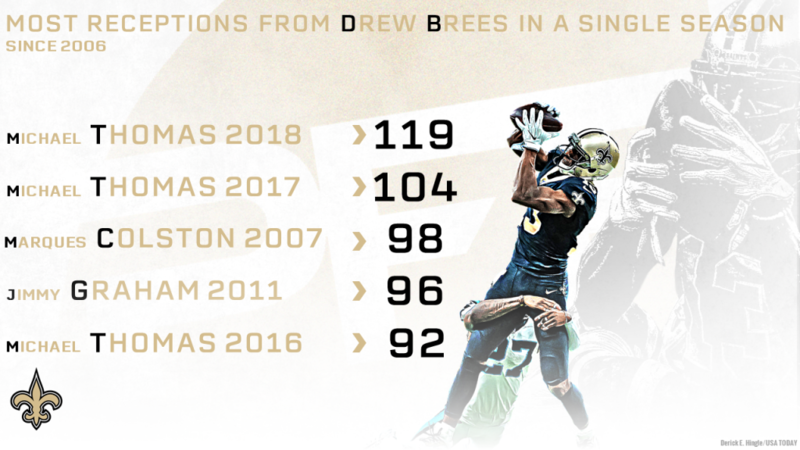 Fortunately for the Saints, Drew Brees and his team managed to overcome those 14 points, multiple offensive penalties, and some dicey field position to secure a victory and a place in the NFC Championship game, and that was largely due to the play of PFF All-Pro wide receiver, Michael Thomas. It hardly came as a surprise to see the third-year receiver step up when his quarterback and his team needed him most, especially after he spent the best part of the season doing just that.